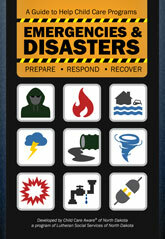 The outcome of an emergency or disaster is affected by your advanced preparation. In an emergency, whether it is a natural disaster, technological disaster or an attack, children may not understand what is happening and may be physically or developmentally unable to protect themselves. Child care programs that have emergency/disaster plans are better able to react and protect the lives of those involved. A basic reference to help home-based and facility-based child care settings develop prepare, respond and recover policies and procedures for emergencies and disasters. This guide does not cover every conceivable situation, but does reference child care licensing rules and safety procedures for emergencies and disasters that are most likely to occur in or near an early childhood setting in North Dakota. A fillable template to help you gather key information, develop plans, assign roles, and assemble supplies needed during an emergency or disaster. Use this template to create a plan. List should include telephone numbers you may need during and after an emergency. Remind parents to update their work, home or cell phone numbers on a regular basis. Keep both a written and electronic version of parent contact information that you review/update monthly. Keep both a written and electronic version of staff contacts that you review/update monthly. Health care plan information and templates are available on the Health and Safety page. An up-to-date, quality photograph and descriptive information help emergency personnel and law enforcement identify a child in the event they are lost or become separated from child care staff during an emergency or disaster. Medication/Authorization forms are available on the Health and Safety page. An evacuation is necessary when it is no longer safe to remain inside the building. If available, comply with evacuation orders of emergency personnel who are on the scene or giving instructions via the phone. North Dakota licensing requires evacuation maps be posted. North Dakota licensing regulations state that child care programs must have an evacuation plan on file with their licenser. Child care sites should have two evacuation locations: A nearby location, preferably within walking distance, to use in case of fire and site further away to use in the event of a major environmental hazard. It is a good idea to have a written agreement with each site in advance of an emergency. This form should be completed by parents and on file for each child. There will be times when it is best to take shelter where you are. The safest shelter-in-place option will vary depending on the emergency/disaster. Sometimes it is best to be on a lower level, other times it is best to be on an upper floor of a building. Items to help you survive during and after an emergency, including food, water, and other supplies. A checklist of supplies child care programs might need if someone is injured or becomes ill during an emergency or disaster. North Dakota licensing regulations state that child care programs must conduct monthly fireo drills adn smoke detector tests and note them on a drill log. North Dakota licensing regulations state that child care programs must conduct monthly tornado drills during the tornado season and note them on a drill log. Use this form to assess the effectiveness of a fire or tornado drill. Modify your procedures as needed and communicate changes to staff so they can be prepared for the next drill or actual emergency. North Dakota Department of Human Services (DHS) rules require that child care providers report emergency closings and relocations to their licenser, within 24 hours. Because county workers are often called out of the office to help during emergency, DHS also requests that providers report closings and relocations to Child Care Aware® at 800-997-8515. This form needs to be completed and submitted when a licensed child care provider takes in additional children during an emergency or disaster. This form must be completed if a licensed child care provider brings an unlicensed individual or someone without a background check to provide additional help during an emergency or disaster. Use this form to keep an up-to-date list of furniture, equipment and supplies in the event you need to make an insurance claim after an emergency or disaster.